Biography: ...Landscape seems to call upon us to be intimate with ourselves, as if to awaken in us pleasures, memories, or hopes that are not yet acculturated. The meaning of landscape is arguably bound up with an appeal to the illusion that within each of us lies something unshareable and not yet socialized. This is partly because of the ineffability of ungrasped sensation perceived in the far reaches of land under open air and partly because it still pleases North Americans to fantasize about nature not as culture and therefore not as a communal experience. Of course we know very well that the reserve into which we place our ideas of nature is a cultural reserve. But perhaps alone among the developed nations, we can still imagine our actual contact with nature to extend past that reserve, as if there were a frontier we hadn't yet transgressed. One photographer who knowingly works within that conflict between the imagined and the transgressed is Robert Adams. Off the freeway near Colton, California, Adams climbed an eroded hillock. 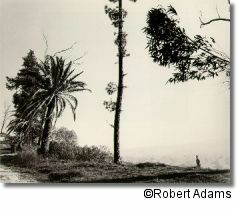 Fumes, haze, and effluents halate the otherwise graphically silhouetted black-and-white tones of photographs such as this and others he made for his book Los Angeles Spring. While the effects are redundant, the compositions are individually realized, each of them variants in an expanding poetic search. What Adams achieves is a poetry of depredation. In an era of landscape color, the black and white strikes a memorial note, and a curious mournfulness pervades scenes of an otherwise humdrum brutality. It's not that Adams appears to think tenderly of these undeserving views, but that in capturing them as moments of lonely experience he projects them back into a nineteenth-century landscape tradition and perceives their horizons as seemingly deserted now as they were then. A weariness of view fuses with the freshness of radiant seeing, as if Robert Frank's vision of a fifties America had blended with the imagery of Carleton Watkins's post-Civil War Yosemite. Adams shows withered eucalyptus trees, abandoned orange groves, and bulldozed, broken stretches of earth. Having earned his attention, they stay in mind as naturalized forms, lost to a process symbolized by the road or developers' trails. In the introduction to The American Space: Meaning in Nineteenth-Century Landscape Photography, Adams writes, "Physically much of the land [the West] is almost as empty as it was when Jackson and Timothy O'Sullivan photographed there, but the beauty of the space-the sense that everything in it is alive and valuable-is gone." Adams considers the nineteenth-century photographers privileged because the clean skies they saw could illustrate the "opening verses of Genesis about light's part in giving form to the void." Their cameras could take their fill of scenes that are now obscured or faded out by an amorphous whiteness against which the reminiscent photographer now has to struggle to describe depth.